The FCC Aluminium Multibarrel Kit has reached its Fourth Generation!! 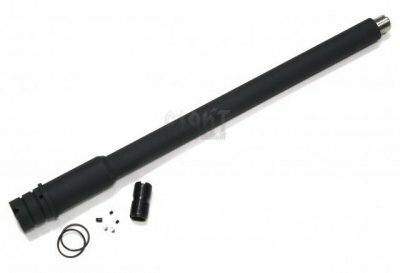 We gathered knowledge and experience and came up with the most sturdy, realistic, length-correct aluminium outer barrel. We've also addressed BB feeding issues, and upper receiver alignment issues many users suffers, especially where different brand T.W. parts are used. Minimal screw in joints, minimal bend and minimal alignment problem. While inherited the same machine and finish quality as our previous versions, black hard anodized 6063-T6. This full set consists of our barrel base and an extension for 12.5" setup, complete with threaded inner barrel stabalisers (CW/CCW) and parts.